The franchise that keeps on jabbing delivers a sucker punch to the audience’s heart in the Italian Stallion’s final bow. Rocky Balboa (Stallone) is officially retired from the ring after his brain-damaging stint against the Soviet’s lethal machine Ivan Drago. However, that doesn’t stop money-hungry managers from trying to get him back into the sport. 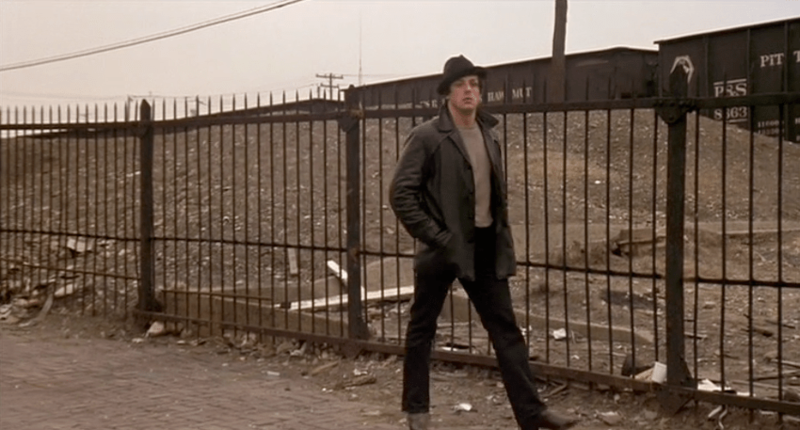 Meanwhile, a young hopeful named Tommy Gunn (Morrison) begs Balboa to work as his mentor. This opportunity with Gunn is an opportunity to be involved in the profession that he so loves without risking any serious consequences. Not to mention it feels good to be relevant again considering that his brother-in-law Paulie (Young) caused the family to lose all of their money. Balboa is excited about his new protégée. They win match after match and prove to be a really strong team. The problem is Balboa’s mentorship with Gunn causes him to neglect his wife Adrian (Shire) and son Rocky Jr. (Stallone) who is going through a tough transition from riches to rags. This tense dynamic changes when a greedy manager with a fur coat (Gant) sinks his claws into Gunn. Having dollar signs in his bright eyes, Tommy develops the moniker “Machine,” has a beautiful woman on his arm, and buys a new car. With Gunn’s newfound fame and fortune, Balboa is left in the dust. The steam is clearly running out in this franchise so the victory isn’t as meaningful. This is especially true considering that the opponent isn’t some war machine or smack-talking contender, but rather a person that Balboa genuinely cared about. I think this addition seemed to lose its eye on the prize. It also lost sight of the heart that makes this franchise so noteworthy in the history of cinema. Released when budding tensions between the U.S. and Russia were starting to unwind, Rocky IV is a fine successor to the original film, aiming for political resonance. Rocky Balboa (Stallone) is officially retired from boxing and living a comfortable life with his wife Adrian (Shire), son Rocky Jr., and brother-in-law Paulie (Young). Rocky’s blissful life, however, quickly turns upside down. His former opponent turned confidant Apollo Creed (Weathers) declares that he is going to take on the seemingly unbeatable Ivan Drago who is just as robotic as the robot Paulie received as a gift for his birthday. Creed is feeling inadequate and unmemorable due to his losses. Rocky is going out on top, but Creed is still aiming for some pride. He is hoping that a match with Drago will make him feel deserving of a legacy. The tension building to this match is so thick that you couldn’t cut it with a knife. Everyone is trying to convince Creed to back off from the fight, but he refuses. He is looking for the honor that he lost when Rocky took the title of the top heavyweight fighter. After the fight ends in tragedy, Rocky finds himself in a position where he must weigh the family he loves against the sport that has become part of his being. Always the fighter, Rocky travels to Russia for a vengeance match against Drago. I wish we could get all of our adversaries on our side with a mediocre speech, and the ability to punch someone in the face. Nevermind that a majority of the film is montage, Rocky IV quickly jabs at your heart with the loss of another iconic character from the franchise. The underdog aiming to succeed continues to be entertaining, even if the films don’t push themselves any further than pairing Rocky against some other opponent. This film is memorable for its timely relevance, adrenaline-pumping soundtrack, and intense final bout in the ring. Rocky can’t retire even if he wanted to. The same holds true for this franchise, which is still going strong. 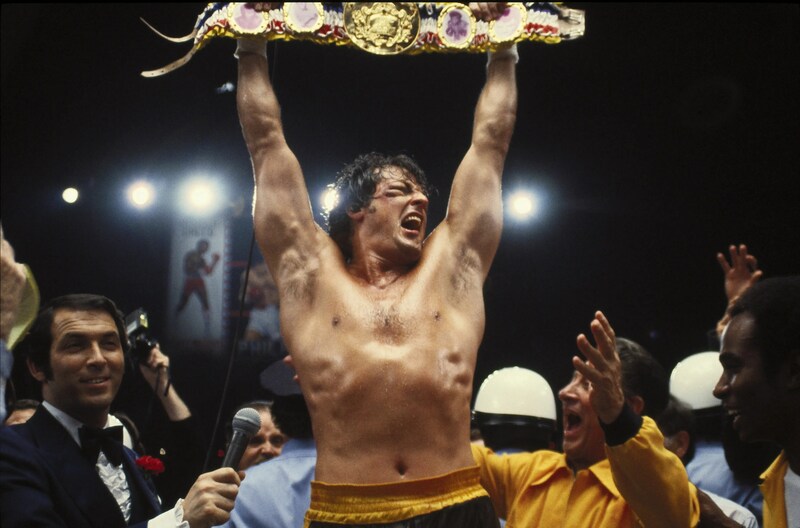 Rocky Balboa (Stallone) is living in the glory of being the top heavyweight fighter in the world. He’s got a nice place, his face is plastered on the cover of magazines, and he has the luxury of doing charity bouts in the ring, just for fun. However, his cloud 9 vacancy gets a heavy dose of rain when the brutal savage Clubber Lang (Mr. T) challenges him to a fight that will determine who is the true heavyweight champion of the world. Lang’s savagery knows no bounds and for the first time, Rocky finds himself unable to get back on his feet. Feeling remorseful and defeated, Rocky has given up until his former adversary Apollo Creed (Weathers) shows an interest in the Italian Stallion. With Creed, Paulie (Young), and his wife Adrian (Shire) at his side, Rocky trains harder and builds endurance for his rematch against the vicious contender. This film doesn’t stretch further in storyline than the first two films, aside from the loss of an iconic character. Even the workout montage seems like it’s lacking some muscle tone. While the film isn’t completely soft, you could see it losing some definition. The most exciting moment in the film is when Adrian finally grows a backbone. I wish Apollo Creed would have served some higher purpose than just pushing Rocky along. However, this is one part of an iconic franchise. This film won’t knock you out, but as part of cinematic history it is worthy of a viewing. The Italian Stallion is back for another bout in the ring. The pride of the fight is hard to stifle and it’s inevitable that Rocky’s passion will bring him to fulfill his destiny. Rocky Balboa (Stallone) is feeling a bit lost after the split decision match with Apollo Creed. At first everything seems exciting. So much so that he buys a house, dog, and car all in the same day. However, the giddiness that came with the money from the match ends when reality comes knocking at his door. Rocky needs to get a regular Joe-shmo job if he wants to provide for his new wife Adrian (Shire) and the baby that she’s carrying. He tries his hand at working in the meat packing plant where his good friend Paulie (Young) works, but each slab of meat is a taunting reminder of what used to be. It’s a good thing he gets let go from that job or meat would have eventually ended up in pieces all over the floor. The urge to get back into the ring is driven further by Creed’s constant gloating and prodding. He wants to take on the Southpaw again and prove that their initial match was just a fluke. Soon Rocky discovers that he can’t run from who he is meant to be. With the help of his wily, grizzly trainer Mickey (Meredith), Rocky gets back into fighting shape for his revenge match with Apollo Creed. Cue the workout montage. I may be an anomaly here, but I find this film to be more enjoyable than the first. This is in large part due to the fact that Stallone seems to have found his footing. His acting is more believable, the stakes are higher, and I can actually understand every word that Rocky says. This isn’t to take away from the first for its originality and machismo. Still Rocky II offers a fully-realized character who feels pain, needs to find self-redemption, and has obvious flaws and insecurities. It’s for this reason that Rocky finds a place in his audience’s hearts. This classic sparked a franchise that has undeniably left a mark on film history. Rocky is the story of an underdog who has to work hard in order to achieve his dreams. Set in Philadelphia 1975, Rocky Balboa (Stallone) is a club fighter that displays an animalistic fire in the ring. He even shows his primitive nature inside of a pet store when he does a Tarzanian wild call to a caged dog. It is in this very pet store that Rocky meets his love Adrian (Shire). Adrian inspires Rocky to leave his solitary life as a loan collector and truly find greatness. This opportunity presents itself when a high-octane heavyweight fighter named Apollo Creed (Weathers) offers Rocky the rare opportunity to take him on in the ring and prove himself as a contender. The fight seems like a sure win for Creed, but Rocky matches him blow for blow. It is difficult to decipher whether Rocky is driven by money or pride when he steps into the ring, but either way the scenes leading up to the fight are when the film starts gaining traction. The fire in Rocky’s eyes burn brightest. Nevermind the awkward interactions between Rocky and Adrian, also forgive the mumblings of the Italian Stallion, this is a film worth watching. You can feel the energy in the air that Rocky is destined for greatness and that this is only the beginning of his journey. As a stand alone film, I don’t think it would have held up without the franchise that surrounds it. That being said, it’s where you should start to get a sense of who you are rooting for. Stallone has created a character that is passionate and talks a mile a minute, but is easily likeable and someone you want to see be successful. Rocky offers the one-two punch of determination and skill that proves any underdog can be a contender.